There are several NPCs, or non-player characters, you may see lurking about the site, including the Mayors of all the Villages, as well as our resident reporter, Anchorman Frostbite. With regards to the NPCs we would like to clarify some rules and remind everyone of some etiquette when it comes to our non-player characters! NPCs are not Staff, Admins, or MODs. This means they cannot help you with site issues, problems, or accept suggestions. Please keep all interactions with them limited to an in-character basis. NPCs are also not able to give out certain information, so please understand if they do not answer some questions or are vague! They only know so much. Please do not ask to play an NPC. Please do not draw shipping art of the NPCs together, it makes them uncomfortable! Drawing them interacting and having fun is totally fine, but do not draw any romantic shipping, please. Treat the NPCs as real people! They exist in the universe of Furvilla, treat them with respect. All rules for site interactions apply for interacting with NPCs, meaning treat them the way you would treat anyone else on site. The NPCs are very busy and have a lot to do, so if they are unable to reply to comments or messages, please do not take it personally! Please do not send the NPCs gifts. They love and appreciate them, but are unable to accept them! Official NPCs are designated by a silver color to their username and the rank of NPC on their profile and under their username when they post on the forums! At this time, the above listed are the only NPCs on site. Please enjoy interacting with the NPCs, but please keep these rules and etiquette reminders in mind as you do! 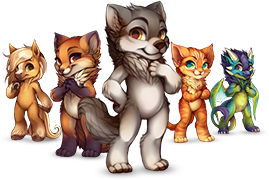 We would like the NPCs to be a fun and interactive way to have fun with the users and bring more depth and lore to the world of Furvilla.